Living room is primarily designed for guest, visitors & much socializing. First impression is last impression so if your living room is more specious then it feels more refreshing & automatically removes all your stress & tension. Every one taste is different like someone like simple, traditional, glamorous look to their living room. This all is depends upon your taste. Your home should tell the story of who are you & be a collection what you love. So for presenting all your collection & decorating more you require interior designer. 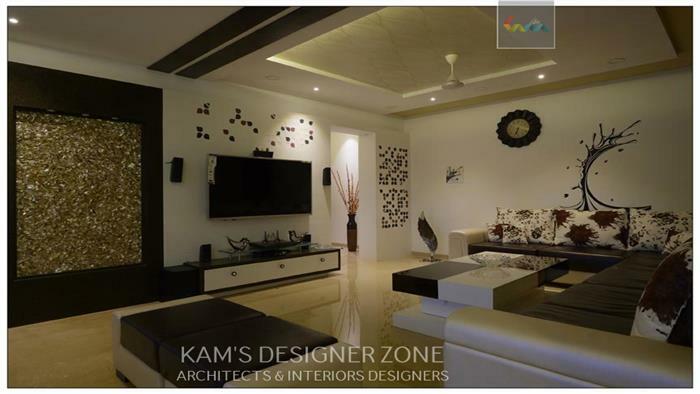 Kam’s Designer Zone is the best interior designer in pune which helps to renovate or decorate your home within your budget. Simple, Light and Clean Living room Interior Design: If you want simple, light interior design then your main focus is on color combination & light. You can also use wall paints which gives different look. More light & mirror in homes create fresh & bright atmosphere. Don’t put extra furniture &or cover all your walls with too many paints or photos. Color combination depends upon your taste but white color with black or brown color combination gives warm look to your home. Traditional look to Living Room: Living room is the place where you feel very comfortable with your friends & guests. If you have to give traditional look to your home then use bright color like red or purple & also you can use textured wallpaper which gives different & unique look to your home. Don’t miss wood paints, candles & cozy furniture. Choose fabrics such as fur, silk or satin which carry traditional look. Buy furniture which is similar to color shades like sofa. Glamorous look to Living Room Interior Design: Now a day’s many people look towards modern look means people see in movies & prefer modern look. If you are planning to give modern living room interior design then your primary focus is on color, & it is the main point of interior design. Use lavish lighting, stylish glass & basket which give effective look to your house. While choosing furniture go for sophisticated look that allow guest to sit back & relax. .